Each year I have complete bloodwork done as part of my wellness protocal. Last year was different for me. After unpacking my summer worddrobe I realized all my clothes were tight. Geez….I thought "it sure was a rough winter and I did not get out and walk nearly as much but I was surprised by the pounds I had put on. As the Doc went through her checklist I told her I was definetely feeling more tired…my skin was dry and I had gained 10 pounds in one winter season. She suggested I start exercising and increase my Vitamin D. Then I said, "Do you think it could be my Thyroid?" She said she would run some labs and let me know. Within 3 days her office called and suggested I start Synthroid (T4 medication) immediately and that I would have to be on it for the rest of my life. I set up an appointment to discuss this approach. I asked, "why do I need to go on medicine for the rest of my life?" Her reply, "BECAUSE YOUR THYROID IS NOT WORKING!." I thought to myself and this medicine is not going to do anything to help my thyroid START working. I decided to do a thorough review of my lifestyle and wellness plan leading up to this diagnosis and I realized one big change I had made last year was to become "gluten free." What I did not realize was that all the "gluten free" products I was consuming were simply replacing wheat flour with cornstarch, rice starch, potato starch, or tapioca starch. The problem was these foods trigger the glucose-insulin response that causes you to gain weight and increase blood sugar even MORE than wheat products. For me this contributed to elevated blood sugar, weight gain and leaky-gut! I had also become the caregiver of a close family member who was critically ill. The emotional stress of the possibility of loosing this loved one and the responsibility I felt in helping them get well had thrown my stress levels through the roof. I decided to take a pro active approach and be my own detective. I am not against pharmaceuticals yet I did not want to begin there. I felt I had to give myself a chance to explore all of the options and as a natural health practitioner I wanted to understand what led to this change. The first thing I did was run the correct panel of of numbers to get a more precise understanding of the clinical picture. This is a big bone of contention in many medical offices because the Standard of Care dictates they only evaluate the TSH level. (Thyroid Stimulating Hormone) and maybe T3 T4. There is a great deal of controversy around this approach as Conventional Doctors have adopted the TSH as the "Gold Standard" If the TSH is normal, the search for hypothyroidsim usually ends. The problem here is many people with Thyroid disease have normal TSH levels because the TSH is a Pituitary hormone. Unfortunately, this test cannot measure if all your cells and tissues are receiving the released thyroid hormones. If you are –the TSH result will be normal. The best way to use the TSH lab test is in diagnosing a pituitary problem, not a thyroid problem. A very low TSH with a low free T3 gives away a pituitary issue. As a Certified practitioner of Dr. Klinghardt’s work I often hear him in the back of my mind saying "Treat the patient…not the lab!" Once I began to understand these 2 triggers I was not ready to jump into a lifetime of meds but I was ready to make some corrections. Having yearly blood work done is something I recommend for all my patients. Unfortunately, most doctors do not really know how to interpret the results. They simply look for highs and lows and do not consider the patterns and trends. I ran all the tests outlined in #1 of the Thyroid Reference Guide as designed by Mary Shomon along with a CBC, metabolic and lipid profile. In conventional medicine if you have a heart issue the Doctor doesn’t usually ask about your liver and if you have a gall bladder problem the Doc doesn’t typically ask about your heart. They treat each organ as a separate entity. This is like designing and building a new kitchen without considering how big a family you have. In my own case the M.D. never inquired about lifestyle changes or other factors that may have been a trigger for my body to change from normal to abnormal. This Doc only wanted to write me a prescription. As we we’ve said before when all you have is a hammer everything looks like a nail! Take a look at this to better understand the relationship between systems. Having had a history of low Vit D, the emotional stress I was dealing with which was impacting my physiology, food intolerances leading to leaky gut and inflammation I was an Auto Immune Disease text book case. 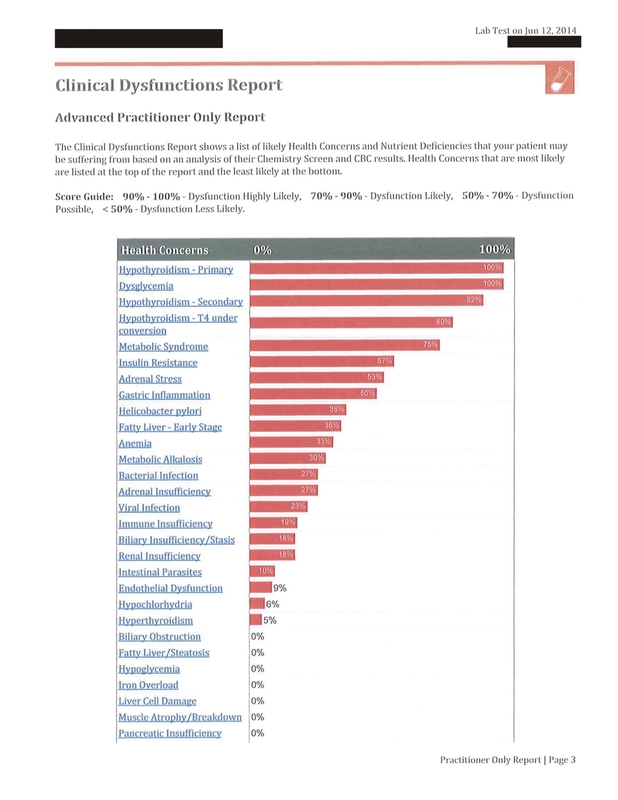 The standard & optional ranges for Functional health is a different range than you would find with standard lab criteria. The reason is labs such as Quest or LabCorp compare the findings to a population of diseased patients while the Functional model standard compares you to optimal wellness. The result is Functional practitioners are able to detect underlying imbalances and identify anomolies long before you develop pathology. Doesn’t is make sense to make the correction BEFORE you have a diagnosis? 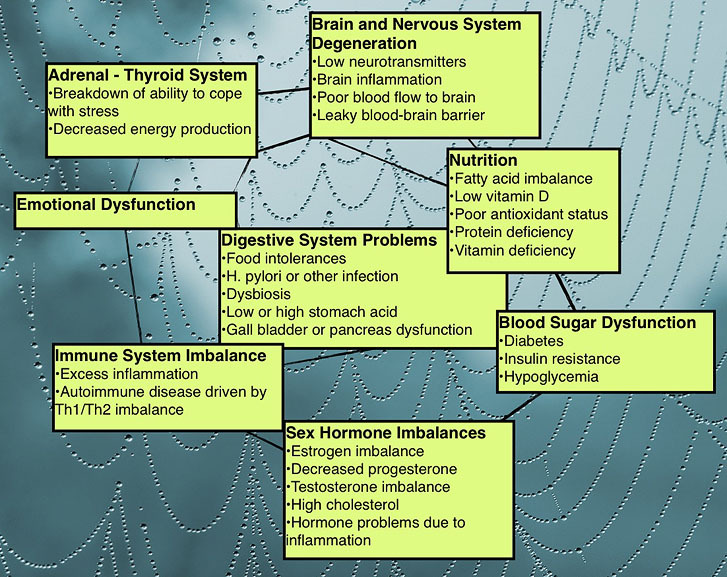 This can be very helpful in seeing the totality of the system and not just what one organ like the Thyroid is working or not working. If I had relied on the M.D. I would have never understood what led up to these findings and I would have been on medication for the rest of my life. With Type 1 Hypothyroidism, the thyroid does not produce sufficient amounts of hormone to maintain “normal” blood levels of hormones, which in turn will maintain normal blood levels of thyroid-stimulating hormone (TSH) produced by the pituitary. Do you know that Thyroid disease is the most under diagnosed disorder and the most mis-treated condition? Sadly, most Doc’s really miss the mark here. When a thyroid disorder is identified the standard of care since the 1960′s is the prescribed medication of synthetic leothyroxine sodium, also called l-thyroxine or just plain T4. Brand names can include: Synthroid, Levoxyl, Levothroid, Eltroxin, Oroxine, Unithroid, and others. is Synth. Doctors are taught the problem is just in the thyroid, when most of the time it is not. T4 is a storage hormone. Your thyroid also produces T3, T2, T1 and calcitonin. For many, taking T4 is like taking an elevator that only goes to the 5th floor when you are trying to get to the Penthouse. Do you know what the 3 different pathways for developing thyroid disease are? Thyroid conditions most often occur because of a problem somewhere other than the thyroid gland itself, which is why the blood work can be normal and you still not feel well. There are 3 reasons for this phenomenon…. Hormone resistance is the fastest growing pandemic in the world and you probable never heard of it. Have you heard of Diabetes Type II? The problem here is glucose cannot get into the cell. Type II Diabetics have plenty of insulin but the cells can’t get the message to let glucose into the cell. Likewise with Hormone resistance or Type II Hypothyroidism there is plenty of hormone but the cell is resistant to taking it in. Active T3 thyroid hormone cannot be used in the cell because the receptors to T3 are non responsive. Your cells are literally starving for T3, but the feedback loop from the pituitary gland gets the message that there is adequate T3 and signals the thyroid that everything is okay. This can result in normal TSH levels and then the Doc tells you, “your labs are fine…you do not have a thyroid condition. Most doctors simply address the thyroid without considering the underlying issue. In hormone resistance there is a good chance that inflammation in the cell is the problem. One of the causes is toxins and affects the cell’s ability to receive the message. Hormone resistance is a massive epidemic driven by inflammation of the cell. You may have heard that inflammation is the cause of most health problems today, including diabetes, thyroid, heart disease, and even cancer. However more specifically, it is inflammation of the cell that is the problem. This underlying cause must be addressed. In this condition taking thyroid hormone will do nothing to correct the problem. – A stress-related thyroid condition is the second reason for the phenomenon where your blood work looks normal and you still have many of the clinical symptoms. Perhaps you have been diagnosed and are already taking medication for your thyroid. Maybe your blood work is normal and the Doc’s have said you are fine. Perhaps you have a stress related hormonal imbalance. This was one part of the perfect storm that happened to me. Being the caretaker for my loved one put an enormous stress on me emotionally and physically from which I am only just recovering. You could be one of the estimated 80% of people who have an auto-immune thyroid condition, meaning that you body is attacking itself. 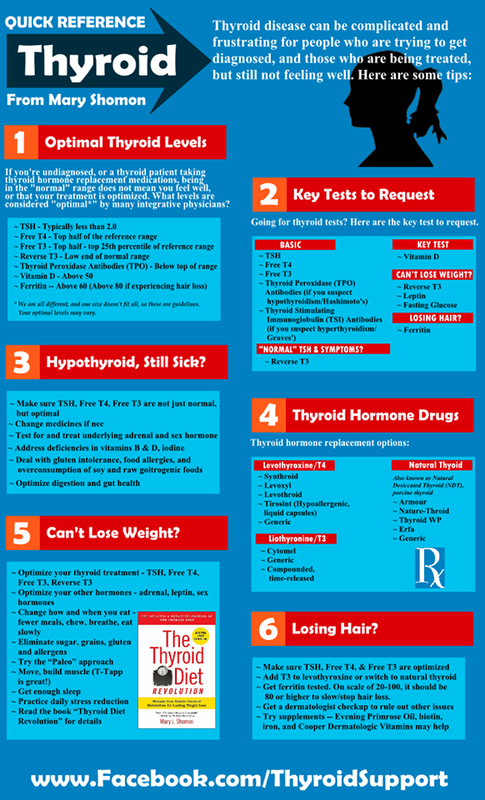 The approach to healing thyroid conditions are different if you are autoimmune, hypo or hyperthyroid, Reverse T3 dominant, or have a Type II Thyroid condition. It takes detective work and a knowledgable practitioner who is willing to not only run the correct labs but knows how to interpret them and provide proper treatment solutions. Let’s be sure to address another part of the diagnosis and that is the emotional/spiritual connection. Louise Hay writes that thyroid is related to "When is it going to be my turn." Thyroid patients are often caregivers, hands on …let’s roll up our sleeves and get it done sort of people. 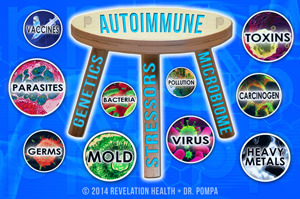 All dis-ease is our body messaging us that something needs to change….and that change does not happen in a pill. Unfortunately, many people are being treated for thyroid conditions with replacement hormones and yet still suffering with a multitude of unexplainable symptoms? This can be true for so many because the doctor points to their “normal” blood work, and therefore the “success” of the medication. Of course there is a time and a place for medication, especially if you are one of those who do not have a thyroid. Find a practitioner who will run the correct labs and is able to interpret them. Then differentiate the treatment accordingly. If you are like me and fall into the Auto Immune category one of the most beneficial things I have done to correct this pattern was a Liver cleanse & Gall Bladder Flush. Did you know: 60% of thyroid hormone is converted from T4 to T3 in the liver? Thyroid hormone influences the way that cholesterol and other lipids are synthesized and broken down and this happens in the liver. This is one of the reasons people with Hashimoto’s and hypothyroidism often have lipid panels with imbalances in their cholesterol, LDL and triglycerides. Thyroid hormone also affects detoxification pathways in the liver and affects the enzyme system which helps us metabolize environmental toxins. When this slows down the toxins build up. How Does the Gall Bladder fit Into this? The liver filters, metabolizes and cleans the blood. Byproducts from these processes are dumped into the gall bladder to help the body get them out. Low thyroid function slows down this whole process, making the liver and gall bladder sluggish and congested and can lead to gallstones? Have you wondered why Gall Bladder removal is now one of the most popular surgeries done every day in this country. It could have all started with thyroid hormones and the liver. Had a patient met with a Functional health practitioner these signs and symptoms would not have gone unnoticed and steps could have been taken to correct the problem and many people would still have their gall bladders. Once I fully understood this I became an advocate for liver cleanses and gall bladder flushes. There are numerous ways to accomplish this and you can find many programs on the internet. I caution you. Some of these programs are incomplete and fall short of the mark and may lead to other more serious consequences. I have dedicated a part of my work to leading groups through this process and will be offering a group again in March. If you would like more information on this please click here. I was addicted to my coffee and never thought I could go 28 days. I am astonished by the changes in my body. My belly is flatter than it has been in years. My skin is glowing again. I am feeling hopeful, interested and encouraged again. I was afraid to do this and I want to thank you Dr. Sharon for your encouragement and guidance. I am so grateful. If you would like more information for the next group in March 2015 please click here. If you have read all the way through this, there’s a good chance you are searching for answers and direction. I could go on and on as there is so much to share and understand. I hope we have provided you with enough for you to become your own advocate and seek better answers, the correct treatment and begin the process of total repair and recovery. This entry was posted in blog and tagged autoimmune, Dietrich Klinghardt, Functional Medicine, hashimoto's, hypothyroidism, thyroid. Bookmark the permalink. ← Why Can I Get Better?? ?